It might be surprising to many, but American Funds ranks as the third largest family of mutual funds in the world, behind only Vanguard and Fidelity. American Funds is a division of privately-owned Capital Group, which was founded in 1931 in Los Angeles. American Funds offers a wide variety of mutual funds to choose from, and also offers two main 401(k) plans based on the size of the company signing up for them. Small business owners can take advantage of American Funds’ Recordkeeper Direct program. The company touts the program as simple to operate and maintain with low-cost recordkeeping and investments. This program is designed for companies that will have total investment assets up to about $3 million and about 250 or fewer participants. Companies that will have a larger asset pool will opt for the company’s PlanPremier plan. Through the Recordkeeper Direct program, American Funds offers 401(k), 403(b), profit-sharing and money purchase plans, giving employers more options to provide to their employees. Participants will get to choose from a wide selection of investments from a single fund family, including the company’s highly-regarded target date funds. Plan sponsors are able to choose from four R Share classes that offer different compensation levels. These plans have no front- or back-end loads, and the fees that are associated with them are low as well. American Funds offers fantastic plan administration and setup support. They provide personalized sales and service in a hands-on fashion, as well as business-building resources. American Funds offers ongoing plan administration that includes investment and plan reviews and in-person assistance with finalist presentations. American Funds also makes it very easy to get set up and onboard, with online and print materials available that make the information clear to plan sponsors and participants. American Funds has an intricate cost and fee schedule that is based on the Share Class and average participant balance. 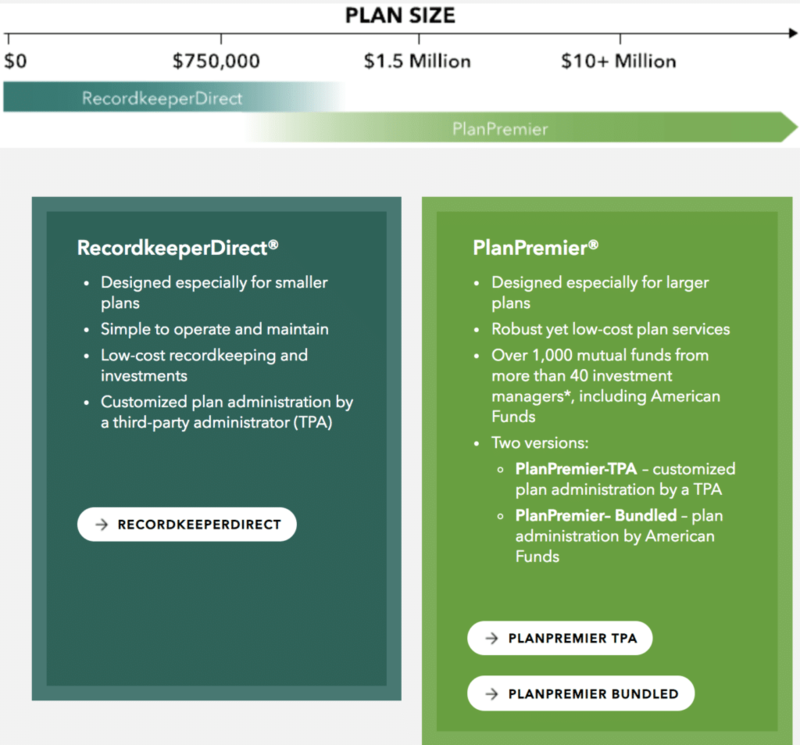 All four options have a one-time installation fee that ranges from $500 to $1,000, and annual recordkeeping fees as well, based on the number of participants and not the plan assets. Advisor compensation is also determined by the Share Class that is chosen. To see a full detailed summary of the costs, visit the American Funds website. American Funds is focused on providing the best experience for plan sponsors as well as investment brokers who work with small businesses. This is great for the employer, as American Funds provides outstanding customer support and help on an ongoing basis. While the company also provides great resources for employers to give to their employees, and typical phone service for employees, the company is more focused on the sponsor side rather than the participant aspect of the 401(k) plan. There isn’t much lacking in the American Funds 401(k) plan. The lack of focus on the participant may be a complaint of some, as may the focus on mainly just mutual funds and target date funds as the investment options. It’s extremely easy to get started with American Funds. On their website, they provide a sponsor site demo that will give you a summary of the online features that help you manage your plan, as well as a participant site demo that allows employees to see all the online tools and resources available to them. Plan sponsors can also get a preliminary free quote by registering on American Funds’ website. They also can be reached via phone at (800) 421-9900.